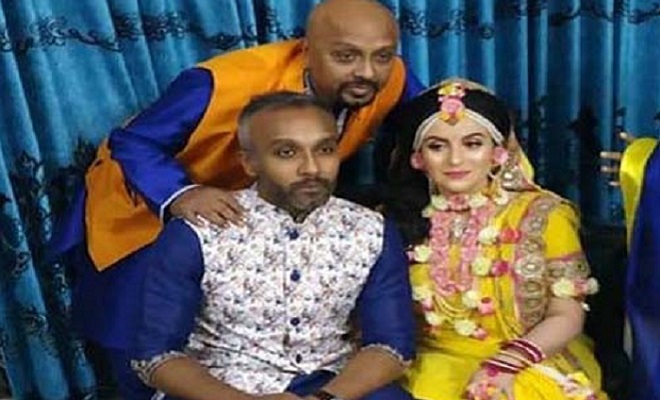 Bangladeshi action hero Rubel’s son Niloy Parvez tied knot with Moroccan bride Jainab Eitokhai on Thursday in the capital. The marriage ceremony was completed following Bengali rituals. The event of ‘Gaye Halud’ took place at ‘Ladies Club’ in Dhaka. Robel’s elder brother Masud Parvez, widely known as Sohel Rana, attended the marriage ceremony. Among others, popular singer SI Tutul, actress Tania and relatives, family friends were present there. Masum Parvez Rubel, renowned martial art hero in Bangladeshi film, married Sultana Parvez Nila on March 10, 1985.